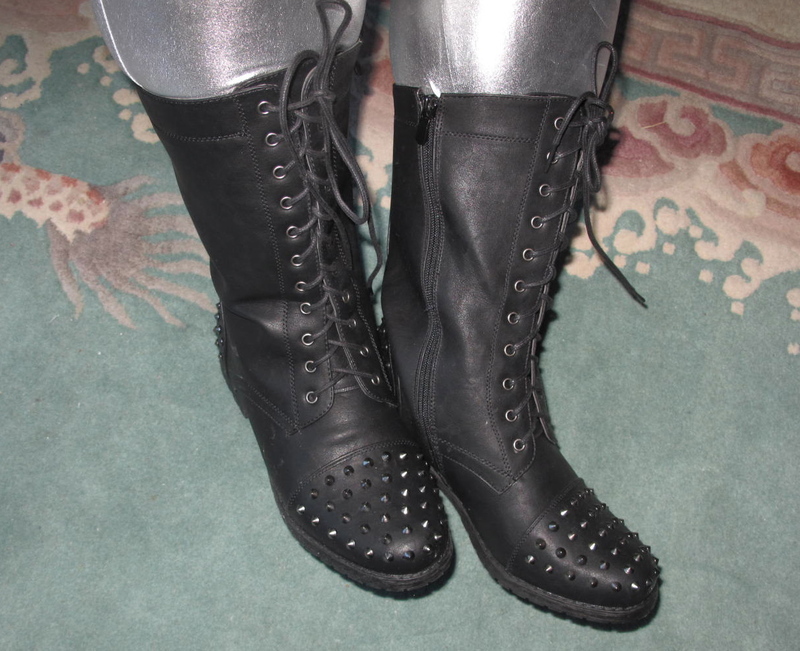 When I saw the Black Minka Studded Boot I knew I just had to have them. I have a deal with my husband that I will not buy boots on line, I think I have sent back 20 pairs over the last 10 years. We have a Torrid about 10 miles away, but I just could not seem to get there. So last week I panicked and ordered them and YAY, they fit. In fact they are on the largish size. I wear a 9.5W and the size 10 more than fits. It is a size 10W and is a little large for me, a tiny bit in the toe and in the ankle, but not so long or loose that I am afraid I will trip over them or the ankle will not provide any support. I have a 18″ calf at the top part of the boot, and they are so big I have to lace them as tightly as possible, as you can see in the photo. I cannot really determine how much larger you could make them with longer laces, laced as loosely as possible, but I would think at least 21″ or 22″. They have a side zipper so I loosened the laces all the way down so I coule get my foot in, but now even laced all the way back up my foot fits right in when I use the zipper. I am just delighted. I could not have imagined wearing spiked boots 5 years ago because they always felt violent looking to my little pacifist self, but I get compliments everywhere I go.